Our dove story began September 26, 2005, the day our Lord took Andrew to his final resting place in heaven. Sgt. Andrew Wallace was fatally wounded by a road side bomb while serving his country in Iraq. Sgt. Andrew Wallace was laid to rest in Woodlawn Cemetery, Ripon, Wisconsin on October 6, 2005. 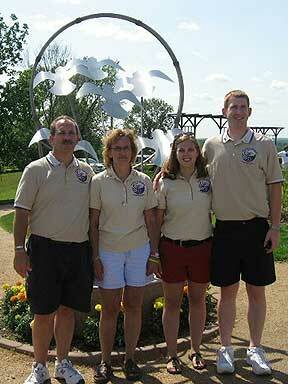 Although we did not know it at the time, seven doves were released at the cemetery during the committal ceremony. A week or two after Andrew was laid to rest, the relative of a friend of ours informed us there was a dove that had taken up residence in a tree across the street from her home. Since this home was only a few blocks from the cemetery, our only thought was that this dove was one that did not go "home"after being released at Andrew's funeral. 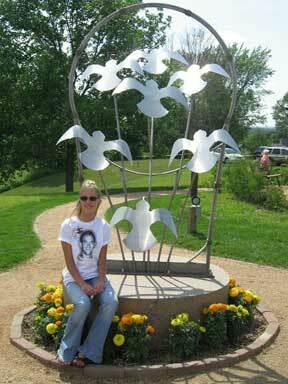 We found out later that the seven doves released at Andrew's funeral did return to their home in Shioctin, Wisconsin, but had a hard time believing this, and insisted this dove was somehow connected to Andrew. This dove stayed in the same tree for several weeks, and we, along with many others by this time, observed the dove as he had developed a schedule. When we would go to the cemetery and also to visit the dove, we felt Andrew was with us. When daylight savings time came around, the dove became a little confused and we knew we had to capture this dove and learn his story. We found a person on the internet that could help us locate the owner by reading the band around the foot of the dove. Our son caught the dove, and as we were talking with the gentleman that needed the information from the band, our son was reading the band on the foot of the dove and we realized it was a local phone number. This bird actually belonged to a gentleman a few miles north of where Andrew was laid to rest. He had released a number of his birds a couple weeks prior to Andrewsís death, around the time Katrina hit in Louisiana. A number of birds were missing from that release and he felt it had something to do with the change in atmospheric pressure related to Hurricane Katrina that altered the birds ability to find their way home. Although we regretted this dove was not one that was released at the cemetery the day Andrew was laid to rest, we felt a connection to this dove because of the circumstances. The last visit we had with Andrew was in New Orleans, Louisiana where Katrina hit the hardest, and the dove had been missing since that time. We feel that Andrew was present in this dove, possibly laughing at us while we were so intrigued with it and thought it was from his funeral. Every time we look at a dove from now on, we will see Andrew. He may be laughing at us, or just watching over us, but we look at it as a symbol of Andrew being with us forever. The dove has now become our connection with Andrew. Web site and all contents � Copyright Joel and Janie Brockman 2007, All rights reserved.